Written by Molly McCafferty of CincyStateofBeing. Photography provided by Cyclebar. Summertime Cincy is in full swing. The days are long, the temps are high, and there is no shortage of outdoor activities. As a Cincinnati-centric online health and wellness publication, we are constantly on the lookout for activities to share with our followers to help motivate and give them access to special, free, or low-cost, health-focused events in the community. We curated a list of ongoing opportunities to get moving this summer and enjoy the great outdoors. Get your calendars out! Free classes are held throughout the week on the Schmidlapp Event Lawn, located next to the Moerlein Lager House. Tuesday: Various Tuesdays throughout the summer, Cyclebar Hyde Park is conducting free classes at 6 p.m. and 7 p.m. View their schedule and pre register. Wednesday: Every Wednesday through September 26, Modo Yoga conducts a class at 6:30 p.m.
Friday: Every Friday through July 27, The Barre Code conducts a free lunchtime barre class from 12:10-1 p.m. Continuing their annual programming, Washington Park hosts free workouts every Tuesday, Wednesday, and Friday. Tuesday: Yoga with The Yoga Bar from 6-7 p.m., followed by Dance Toning with The LB Rookwood from 7-8 p.m. They also have “Pop Up Play: Youngster Yoga” at 11 a.m. every Tuesday through August 7, hosted by The Yoga Bar. Wednesday: Strength/Bootcamp with Central Parkway YMCA, followed by Turbo Kick with Cindy Thomas Fitness from 7-8 p.m.
Saturday: Central Parkway YMCA offers a variety of free rotating fitness classes every weekend at 9 a.m. through September 1. Brink Brewery hosts weekly run groups every Wednesday at 6:30 p.m. Come for the run; stay for a beer. 50 West Brewing Company has runners that meet every Thursday at 6:30 p.m.
Cincinnati Frontrunners and Frontwalkers meet three times a week for non-competitive social runs, meaning all levels are welcome. They meet every Tuesday at 6:15 p.m. at Mt. Storm Park, Thursday at 6:00 p.m. at Eden Park, and Saturday at 9:00 a.m. at Spring Grove Cemetery. Avondale Running Club: This club is the oldest organized African American running club in the nation. Walkers meet each Saturday morning around 9:30 a.m. in Avondale, and runners meet every Sunday at 7:30 a.m. at rotating locations such as Sharon Woods, Winton Woods, Glenwood Gardens, Lunken Airport, Eden Park Overlook, and Mt. Airy Forest. There is an annual membership fee of $15, but the club is open to all who have a desire to stay physically fit and that are passionate about spreading health and wellness in the community. 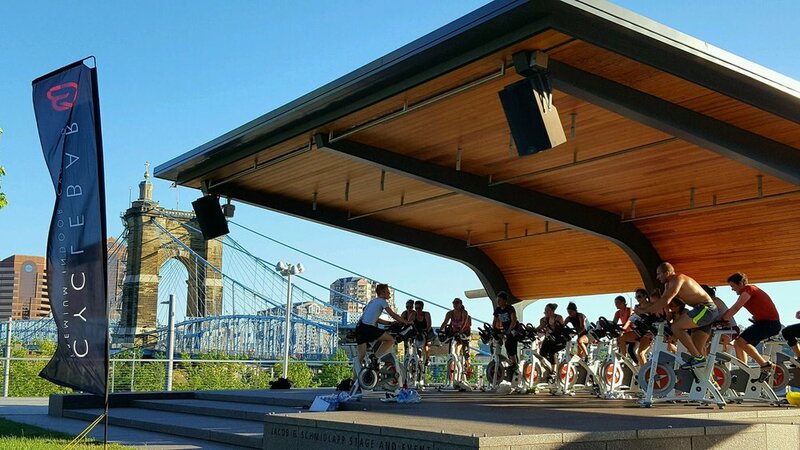 Every Wednesday at 5:30 p.m. through October 31, CincyStateOfBeing hosts a workout at Findlay Market with rotating instructors and class formats. Class price is $5, or $10 if you want to hang out after and have a beer in the Findlay Market Biergarten. Let us know where you’re headed! We hope to see you out there.